The book covers 11 of the most common medical conditions clinicians will see in a patient population: Diabetes, myocardial infarction (heart attack), congestive heart failure, stroke, asthma, breast cancer, prostate cancer, thyroid disease, gastroesophageal reflux disease, hepatitis, and HIV/AIDS. The book is written for non-medically trained mental health clinicians, and the purpose is to help mental health clinicians provide the best quality of care to patients with chronic medical conditions, both through improved patient sessions and improved communication with members of the patient's medical team. The author writes that it is not enough to just know facts about a medical condition – the clinician must learn how to treat mental health issues in the context of medical issues. 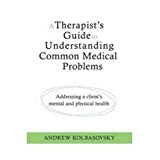 For each medical condition, Kolbasovsky provides the following: an overview; a definition of terms; medical consequences of the illness; medical and behavioral treatments; "good news" about the treatment of the condition; how mental health is affected, including detailed sections on common comorbid disorders of each condition and their medical consequences; vignettes of people with the medical condition, including those with comorbid mental health issues; and additional clinic issues, including incorporating behavioral treatment into medical treatment. In Chapter 5, "Asthma", Kolbasovsky describes asthma in a way that is easy to understand, yet still retains medical accuracy. He also describes asthma's four levels of severity. The "important terms" section defined such essential asthma terms as "peak flow meter", "bronchospasm", and "bronchodilators" (p. 117). The author also makes the important point that asthma symptoms can prevent people from socializing. On page 124, the author lists questions that clinicians should take into account when treating a client with asthma and comorbid panic attacks. This list was thorough, and covered fears related to medication side effects and feelings of loss of control. When the author listed the types of medications available, it would have been helpful if he listed the brand names of these medications. It also would have been helpful if the author had included statistics on the increased amount of asthma deaths among the uninsured, as this is a very pertinent issue today, especially with clients. In Chapter 6, "Breast Cancer", the author has a thorough list of terms and definitions, including the various cancers of the breast. The chapter also has a helpful description of the stages of breast cancer, from nonexistent to severe. A list of side effects to surgery, radiation, chemotherapy, and hormone therapy, and biological therapy are given, including an often-overlooked side effect of surgery – difficulty with balance. In regards to breast cancer and comorbid depression, the author recommends "booster sessions" of therapy after treatment has ended. In booster sessions, the patient can be reevaluated to determine recurrent depression. The chapter also has an interesting section on breast cancer and comorbid post-traumatic stress disorder. In Chapter 8, "Thyroid Disease", the author again describes the condition in a way that is easily understood, and written at an appropriate level for mental health clinicians. The author details both hyperthyroidism and hypothyroidism. The author presents data regarding the prevalence of comorbid depression and common demographics of that population. The author emphasizes the importance of asking patients about a personal and family history of medical conditions. The author makes an important point that anxiety is occurs not only in hyperthyroidism, but hypothyroidism as well. At the beginning of the book, there is a "Quick-Reference Table" which lists the medical conditions, comorbid health conditions for each, and the location of that information. It is a great way of getting directly to the information you need. The book contains 78 pages of up-to-date references. The vignettes in each chapter were very helpful, and included a diverse cross-section of people. They were of an appropriate length, and gave enough information without becoming verbose. This book is recommended for all mental health clinicians, as they will most likely encounter patients with chronic medical issues in their practice.